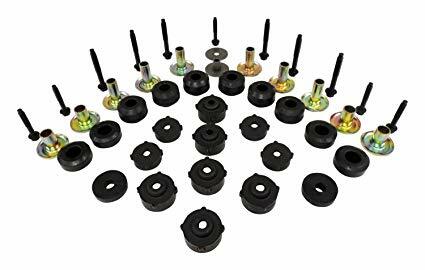 Includes Upper & Lower Grille Mount Bushings, Grille Mount Retainer, Grille Mount Washer, Upper and Lower Body Mount Bushings, Body Mount Retainers and Specialty Bolts. Replace The Broken, Rotted, Or Missing Body Mounts With A Body Mount Master Kit From Crown Automotive. Included Are All The Body Mount Bushings, Retainers, Washers, And Bolts For The Body And The Grille.